Are you in shock...it is not a card. I finally broke down and acquired the cute Bookmark die by Avery Elle. It is just so adorable and can be used as a bookmark or a tag. 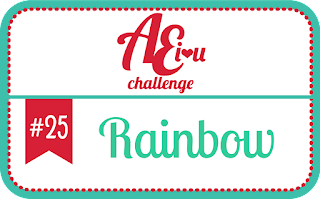 I am playing in their Rainbow challenge, as well as a new challenge from Memory Box. 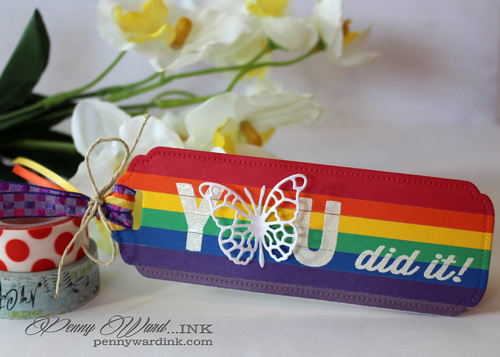 I loved the idea of using rainbow colors for my bookmark. 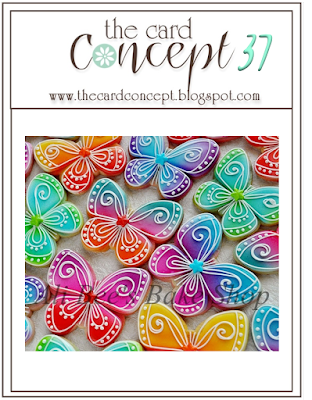 By adding a simple embellishment like the Pippi Butterfly...you are able to give it to your recipient with the butterfly having some dimension, and they can use it in a book not having worry about ruining the bookmark, because the butterfly will lay flat also. Stamp the sentiment and heat set with white embossing powder. Tie ribbons at opening. Spritz butterfly with Sheer Shimmer Sparkle and adhere to bookmark. GORGEOUSNESS complete AND total!! Amazingly done and so full of rainbow fun!! I think it is fun to sometimes make something other than a card!! Have a super fantastic week!! This is so fun and creative! What a great idea. Thanks for joining us at The Card Concept! Oh my goodness!! How fun is this?!! 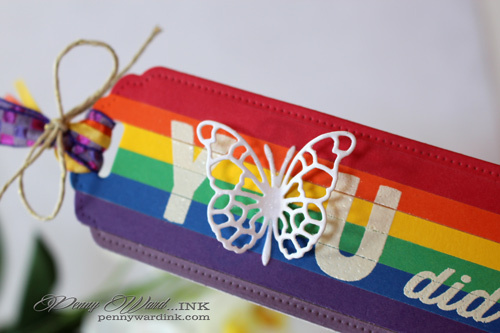 Love, love, love how you blinged up your bookmark with that bright and beautiful rainbow - perfection!! Thanks so much for playing with us at the AEI♥U Challenge - we're so glad you did!! I love the use of the butterfly as the "o" in the You! Great idea!